Home Porsche Driver’s Selection Porsche men's clothing: functional and elegant. Men's T-shirts: from slim-fitting to casual. Men's T-shirts: from slim-fitting to casual. Porsche men's T-shirts are highly versatile. They are the ideal accompaniment for every look and are the must-have fashion basic for every closet. Whether you prefer T-shirts with or without motifs, in red or in white, we have just the thing for you. Demonstrate your allegiance to the Porsche brand by sporting the Porsche crest or car models on your T-shirt. Sporty printed motifs and small applique designs transform a simple T-shirt into something unique. Combined with jeans or formal trousers, these T-shirts are an essential fashion basic. 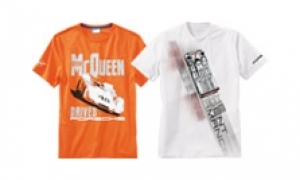 Make your own impressive fashion statement with men's T-shirts from Porsche Driver's Selection. Collector's T-shirt edition no. 7 - "Classic" - limited edition.